Bolivian Pink Salt is a crystal rock salt harvested by hand from ancient rock salt beds discovered under the Andes Mountain region of Bolivia. Bolivian Pink Salt has a beautiful rosy-pink, speckled hue. 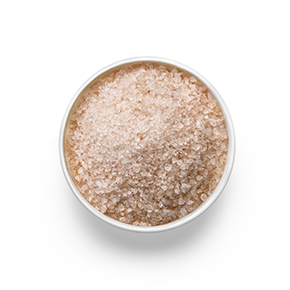 In addition to its sodium chloride (salt) content, Bolivian Pink Salt is remarkably rich in other minerals including Calcium, Potassium, Magnesium, Iron and an array of other essential and trace minerals, making it a highly nourishing and functional ingredient for bathing, exfoliation, mouth rinses and other cosmeceutical applications. Bolivian Pink Salt is carefully harvested by hand, processed to remove impurities, crushed to the appropriate grain size and then stored so that the salts retain their purity, freshness and their natural balance of minerals.